WASHINGTON — The U.S. Department of Transportation collects relatively small civil penalties against the railroads it regulates, as concern grows over the safety of shipping large volumes of crude oil and ethanol in tank cars long known to be deficient, federal documents show. A McClatchy review of annual enforcement reports shows that the Federal Railroad Administration rarely fines any company more than $25,000, though it’s authorized to collect a maximum of $175,000 per violation. Some fines are as little as $250, and most settlements are substantially lower than the agency had first proposed. Additional documents obtained by McClatchy reveal that the agency agreed to a $17,000 settlement in September 2010 with the Canadian National Railway over a June 2009 derailment in Cherry Valley, Ill. The accident killed one person, injured nine – including two firefighters – spilled more than 300,000 gallons of ethanol and caused the evacuation of more than 600 nearby residents. Two inspection reports filed in the weeks after the accident also show that the violations that resulted in the fine didn’t directly contribute to the accident or its severity, including faulty equipment on cars that didn’t derail or spill their cargo and incorrect documentation of the placement of cars in the train. Such defects would have been violations even if the accident hadn’t occurred. 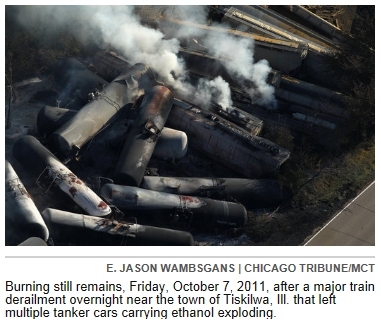 The agency originally proposed a $25,000 fine for the accident, in which 13 tank cars of ethanol derailed, leaked and caught fire. In contrast, the railroad reached a $36 million settlement in October 2011 with the family of the woman who was killed when the fire engulfed her car at a road crossing. The railroad administration collected $13.9 million in civil penalties last year. The small settlement amounts demonstrate a “symbiotic” relationship between railroads and their federal regulators, said Mary Schiavo, a former DOT inspector general during the Clinton administration. “Fines are a cost of doing business,” she said. The Cherry Valley accident prompted a warning in 2012 from the National Transportation Safety Board about the inadequacy of the DOT-111A tank car, the most common type in service on North American railroads. The NTSB is an advisory board that has no enforcement power. Agencies within the Department of Transportation may accept or ignore its recommendations. Since October 2011, tank car manufacturers have voluntarily built DOT-111A tank cars to a higher standard, with features that help prevent punctures and ruptures that could release hazardous materials, and heat damage due to fire exposure. But that still leaves tens of thousands of vulnerable older tank cars that are carrying massive quantities of crude oil from North Dakota’s Bakken region to refineries and transfer terminals across the continent. After fiery derailments in Quebec, Alabama and North Dakota, regulators concluded that the Bakken crude, which is extracted from shale rock through hydraulic fracturing, is more volatile than conventional oils. No one was killed or injured when Bakken crude oil trains derailed near Aliceville, Ala., in November and Casselton, N.D., in December, but the accidents together spilled more than 1.15 million gallons of oil. The derailment of an unmanned, runaway crude oil train killed 47 people last July in Lac-Megantic, Quebec. Philadelphia had a close call last week, when a CSX crude oil train derailed on a bridge over the Schuylkill River but didn’t spill any of its cargo. State and local officials, members of Congress, rail companies and petroleum producers have called on the federal government to issue new guidelines for the safe handling of crude oil by rail and to update the safety standards for tank cars. The Association of American Railroads, an industry group, estimates that railroads moved 400,000 carloads of crude oil in 2012, mostly Bakken. Railroads moved 325,000 carloads of ethanol in 2010, according to industry estimates. The tank cars in the Quebec, Alabama, North Dakota and Illinois accidents weren’t considered defective under federal guidelines. Yesterday, New York Governor Andrew Cuomo issued an executive order directing several state agencies to review the risks posed by trasportation of crude oil by rail in New York. This issue has recently gained attention in Albany as the public has become aware of the large amounts of Bakken crude oil being shipped into Albany by rail, where it is then transferred to tankers that travel down the Hudson River. The Governor’s order requests many relevant actions but also acknowledges that most of this is under federal jurisdiction and thus there isn’t much the state can do about it. Much of what the Governor is requesting has been suggested by the National Transportation Safety Board (NTSB) many times over the years, as the agency did again this past week. And the dance that has gone on around this issue for years continues on, resulting in more press releases, but no action. Valero proposes to offload 100 tanker cars every day. Each car will undergo highly technical and potentially dangerous operations where safety caps are manually removed and valves are tested before hoses can be attached, relief valves opened, and the offload valve is fully opened. At each step in this complicated procedure, fugitive emissions can be added to the air, and minor test spills are intentional and routine. Question: will Valero follow the guidelines of the Federal Department of Transportation, Bureau of Explosives? How much do 100 such offloading procedures every day add to the toxic pollutants in our air, especially as compared to fewer connect/disconnect procedures for marine and pipeline supplies of crude oil?